Rizoma introduces a new kind of grips. Rizoma introduces a new kind of grips. Innovative materials combined with fashionable colors for a renewd product. Thanks two the three adaptors these grips can be considered universal. Length 119mm. Rizoma guarantees a correct fitting only with Rizoma bar ends MA510, MA512, MA520, MA522. These grips does not work on heated grips equipped bikes. 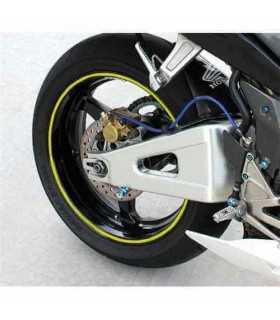 These Grips works on listed bikes withou adding any other hardware except: ?Aprilia and KTM RC8: please order GR418B adaptors; RSV4 only my 2009 and 2010 and not compatible with APRC models. ? MV Agusta every model: please order GR414B adaptors. ?BMW: works only on R1200 S / R 1200 GS / R 1200 R / HP2, with GR416B adaptors. Not compatible with S1000 RR. If stock grips are longer, just move the electric controls.